In Balanced Achievement’s The Weekly 5 series, we aim to present you with five ideas or products that you can utilize to enhance the quality of your life. In this week’s article, we turn our attention to looking at five meditation tools that have come into existence during the digital age. When the ancient Indus Valley Civilization was first excavated along the modern day border of Pakistan and India in the 1920s, scientists and archeologists uncovered the reminisce of a highly sophisticated society that dates back to around 5,000 BCE. In addition to being filled with a treasure trove of artifacts and clues about cultural evolution, language and farming, exploration of the great civilization offered important important insights into the history of religion and practice of meditation. For instance, because excavators found prehistoric wall art depicting yogis sitting in traditional meditation postures, it’s now speculated that spiritual seekers on the Subcontinent were meditating as far back as 7,000 years ago. Over the past two decades, hospitals, universities and medical research institutions have continued to place an ever growing importance on studying the benefits individuals attain from meditation practice. With this increased interest has come new and innovative strategies for monitoring and analyzing the inner workings of individuals’ minds and bodies, and now meditators can bring this scientific practice approach into their home with the Muse brain sensing headband. Dubbed as a ‘personal meditation assistant that takes the guesswork out of meditation’, the Muse uses Electroencephalography (EEG) sensors to measure and track various bodily and cognitive processes. Where as the original Muse, which was released in 2014, is limited to collecting data on mental activity alone, the newly released Muse 2 can detect and analyze mental activity, bodily movements, respiratory rates and heartbeat rhythms. Subsequently, as users’ practice with the device progresses over time, they can then use the feedback to move themselves towards a greater state of internal harmony. At the time of this writing, the original Muse and the Muse 2 are priced at $159 and $250 respectively, and both versions of the devices operate via a Smartphone app. Although there are a seemingly endless number of spiritual lineages and meditation techniques, nearly all meditative practice rely upon the senses to induce present-moment awareness and alter states of consciousness. While achieving these aim from a traditional point of view takes time and meticulously effort, advancements in technology have opened up a whole new world of possibilities and MindPlace’s Kasina Mind Media System shows just how. 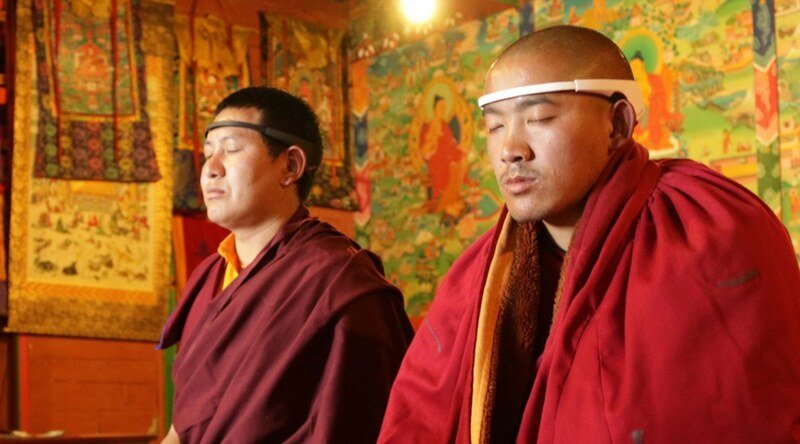 By uniquely synchronizing visual and auditory cues, this advanced light and sound mind machine helps users clear their minds of extraneous thoughts while effortlessly moving them into deeper meditative states. To use the innovative meditation tool, which is named after a Pali word representing an ancient system of visual meditation, all users have to do is choose a session type, put headphones and eyeglasses on, and allow the process to naturally unfold. It should be pointed out that the Kasina auditory device operates with two different sets of spectacles, and users have to close their eyes while wearing the older Kasina Ganframes but are able to keep them open with the newer DeepVision Ganframes. If you think you may be interested in purchasing the Kasina Mind Media System, you should be forewarned that the technologically advanced apparatus, which is sold in bundles along with the required glasses, comes at a cost of $350-400. When considering the feverish pace modern society operates at, in addition to our evolutionary disposition to remain discontented with life, it becomes easier to understand why stress has become a sort of modern-day epidemic. All experienced meditators know how life-affirming formal practice can be in this regard, but that’s not to say that carrying the internal peace and mental clarity cultivated on the cushion is easy to bring with them into their daily activities. If only they had a trusty companion to remind them to be mindful when the going gets tough, they know things would be much less hectic. As luck would have it, they now can have just that with the Spire Stone Stress Management and Activity Tracker. The sleek gadget was designed to monitor, analyze and track respiratory rates so individuals are able to enjoy a more mindful and less stressful existence. By prompting users via a Smartphone app to reset themselves internally whenever their breathing patterns dramatically change because of life’s inevitable challenges, the Spire Stone, which conveniently clips onto a belt, pants or bra, helps turn taxing situations into moments of calm and heedless occurrences into flashes of insight. Moreover, the advantageous apparatus incorporates health monitoring features that rival those of a Fitbit and comes equipped with a battery capable of lasting seven days. Although the Spire Stone has traditionally come at a cost of $149, it’s recently been marked down to just $79. In similar fashion to the Muse and Spire Stone, the Heartmath Inner Balance Trainer uses technological advancements to monitor bodily rhythms and guide users towards a more wholesome lifestyle. Where as the Muse focuses primarily on mental activity and the Spire Stone on breathing patterns, however, the Inner Balance Trainer tracks the rhythms of the heart so individuals can gain greater emotional balance. Scientifically speaking, this innovative meditation tool was designed based upon the ideas that emotional states are directly related to heart rate variability (HRV) and whenever one is in a state of harmony, at the levels of their emotions, mind and body, they’re living in the much desired physiological state of coherence. While most of us have unintentionally experienced this state of congruence at random times throughout our lives, we can now cultivate our abilities to bring it about at will thanks to the Inner Balance Trainer. In fact, by undertaking a practice regime with the device and a supplementary Smartphone app, with sessions lasting just 3-5 minutes, we can systematically cultivate a sense of greater emotional well-being. Better yet still, with additional practice and feedback, we can eventually reach a point where we’re able to stay dignified and calm even when faced with the most emotionally taxing circumstances. Currently, there are two models of the device, the Inner Balance Trainer Bluetooth Sensor and Inner Balance Trainer Lightning Sensor, which come at the respective costs of $159 and $149. For any individual who’s at some point in their live has maintained a meditation practice both at a formal center and in the confines of their own home, it’s certain that they’re well aware of the atmospheric advantages found within meditation halls. And although they may try to bring this peaceful ambiance to their living quarters, as it both inspires and deepens their time on the cushion, the same feel is nearly impossible to recreate. Fortunately, however, this no longer has to be the case thanks to the iHome Zenergy sight, sound and aromatherapy machine. In addition to featuring seven different lighting modes and six different sound melodies, which bring tranquility and calm to any space, this enriching meditation apparatus can add even more to the ambience by diffusing essential oils. With a price tag of only $77.99, and other useful features such as bluetooth and a shutoff timer, the iHome Zenergy Aroma must be considered as one of the most reasonably priced yet valuable meditation tools available today.